A recent spike in federal spending is an energizing opportunity for researchers, the nation’s top scientist said during a visit on April 2 to the University of Florida. 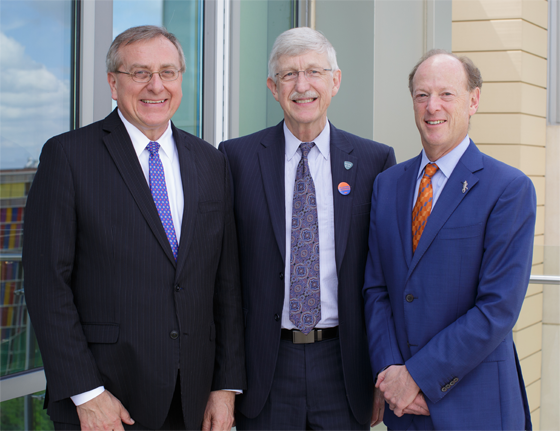 Collins spoke to a packed house of several hundred scientists, staff and health-science students Monday morning at the UF College of Medicine’s George T. Harrell, M.D., Medical Education Building. To cure sickle cell anemia and make major advances against other diseases, scientists should be empowered to take risks and to ask big, fundamental questions, Collins said. That’s where the NIH and its newly robust funding can help. The agency has an additional $3 billion in funding for the 2018 fiscal year, and the largest amount overall since 2003. “That means there are all kinds of things we can go faster on. We can develop that universal influenza vaccine, which we need if we’re going to be protected against a future pandemic or even just to get rid of annual flu shots that don’t work very well. We can come up with strategies to use gene editing to begin to find cures for those thousands of genetic disorders where we know the precise molecular defect, but we haven’t got a solution that will work in terms of therapeutics,” he said. Earlier in the day, Collins visited the Sid Martin Biotechnology Institute. He had much praise for the UF-run incubator in Alachua that has created more than 2,200 high-tech jobs and served more than 100 startup companies in biotechnology, biomedicine and bioagriculture. Following his speech, Collins held a “fireside’’ chat with David S. Guzick, M.D., Ph.D., senior vice president for health affairs at UF and president of UF Health, and took questions from faculty and students. Guzick acknowledged the agency’s financial support as well as the enthusiasm among the many scientists in the audience. Some of the approximately two dozen students who met with Collins privately later in the morning said they were happy he took the time to inspire the next generation of physicians and researchers. He said Collins emphasized that they will all frequently encounter failure as researchers. That is the nature of science. The most important aspect of NIH-funded research is how it helps UF Health scientists make discoveries that improve lives and prevent and cure diseases, Guzick said. The continued growth of NIH-funded research is a result of the state of Florida creating and funding recruitment programs to advance biomedical and life sciences research, said Michael L. Good, M.D., dean of the UF College of Medicine. Established UF Health researchers have been successfully competing for larger NIH grants based on their promising research, while new grants are flowing to recent faculty hired through preeminence initiatives meant to boost UF’s research and academic standings. At UF Health, the NIH supports innovative and important research initiatives, including the Clinical and Translational Science Institute, which accelerates the process of transforming scientific discoveries into improved health care. Good said notable examples of NIH-funded work at UF include first-in-human clinical trials of cancer immunology to treat brain tumors (Duane Mitchell M.D., Ph.D, department of neurosurgery), discovering the genetic underpinnings of neurodegenerative diseases such as Lou Gehrig’s disease (http://neurogenetics.med.ufl.edu/faculty/dr-laura-p-w-ranum/) and important research on inherited muscle diseases (http://research.pediatrics.med.ufl.edu/researchers/research-faculty/barry-byrne/). Collins said scientific research is at a pivotal, technology-driven moment that was unimaginable just a decade ago. Juan Hincapie-Castillo, who is studying for a doctorate in pharmacy, said Collins encouraged students to follow their muse and not to lose focus on the things that excite them in their research or life. “Now I want to read the book,” Hincapie-Castillo said.